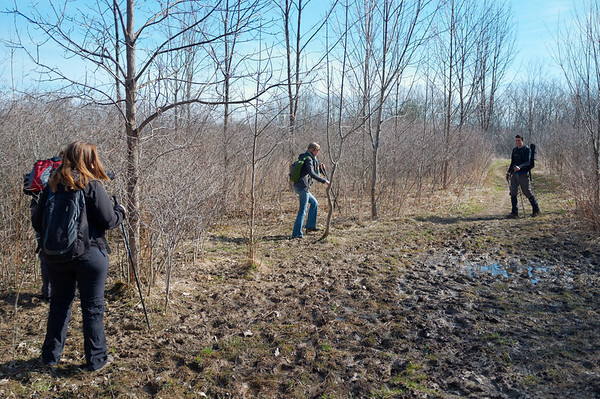 This time I was prepared for the mud now that I found my gaiters, but the moment we stepped into Short Hills Provincial Park, we rejoiced that the muddiness had greatly subsided. No longer were we struggling with quickmud (like quicksand?). 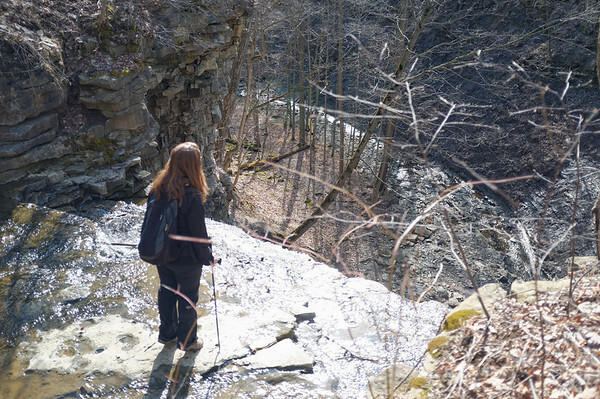 It was easy to make our way to Swayze Falls and even step foot on to the edge of the falls like my friend did. 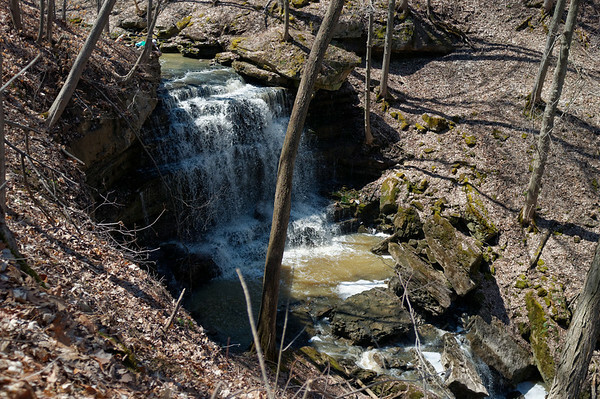 Starting where we left off at Short Hills, we passed by Swayze Falls again. 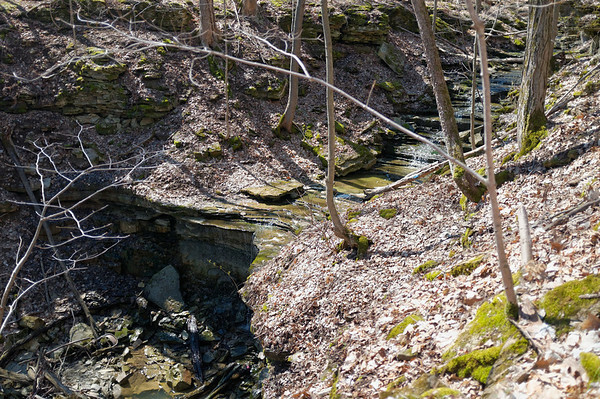 This time since it wasn’t as crazy muddy, we were able to explore the waterfall from much greater vantage points. 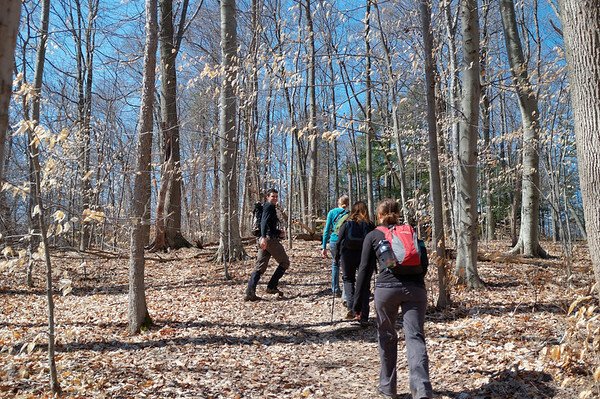 We also had another friend (and part time hiker) join in on the fun and making the trek even more interesting with our hiking group growing temporarily to party of five. Alas, we celebrated a little too soon because some parts were still pretty muddy. Those who didn’t have gaiters got their pants dirty pretty quickly. This situation repeated itself numerous times that day. 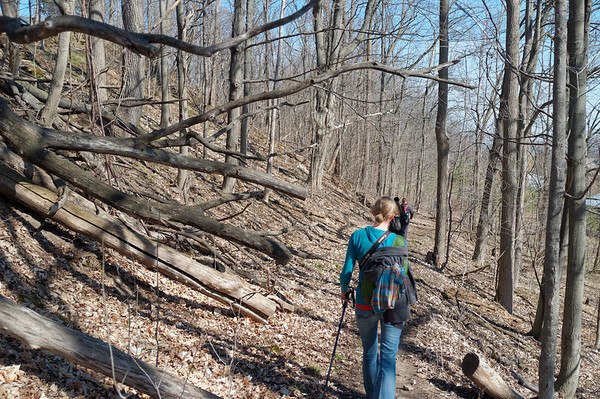 Hiking along the Bruce Trail and escarpment is becoming quite fascinating. We never know what we’ll end up seeing next. 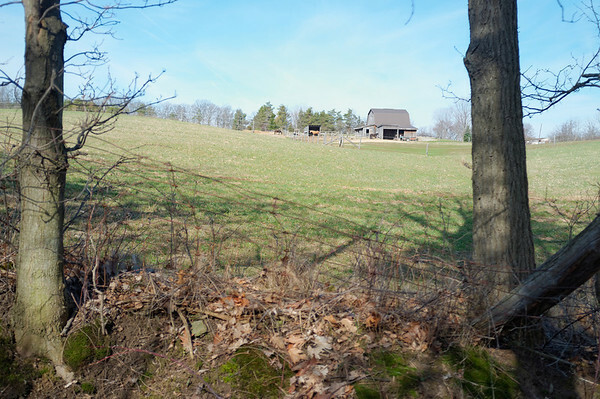 I do enjoy the rustic old wire fences and farms in the distance but it makes me wonder how this land really appeared before it was settled. 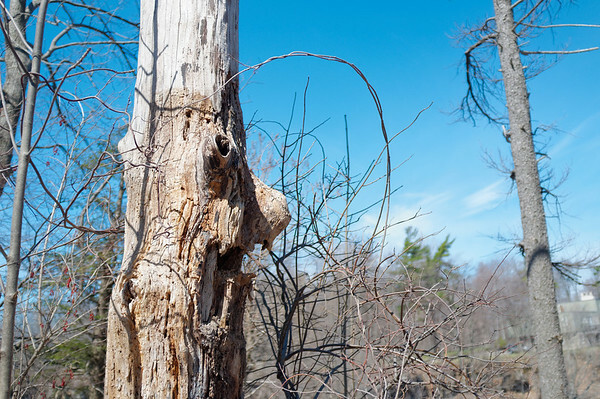 Despite the trees being bare and the relatively cool temperature, you could easily see that signs of spring were everywhere to be found. 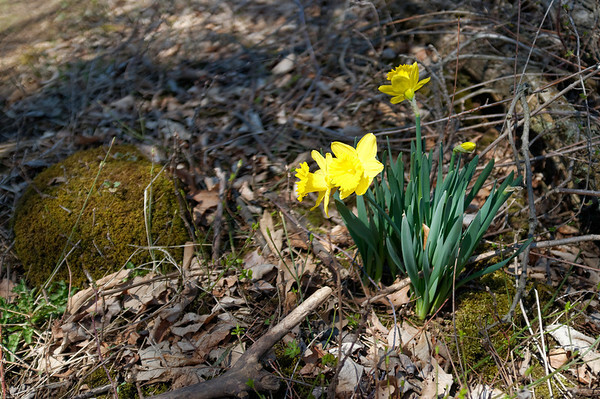 In fact, one of our friends was on a mission to photograph all the signs of spring. I’d say it was mission easily accomplished! 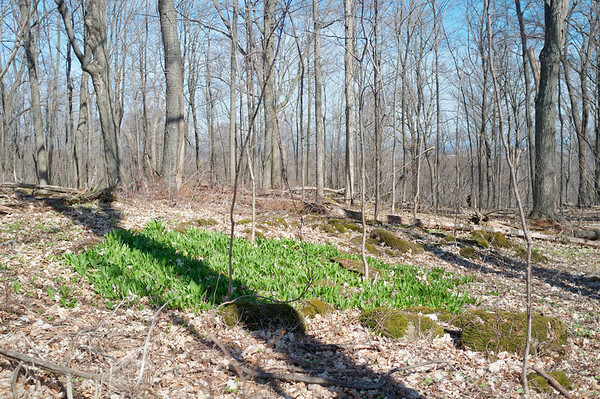 Lots of flowers in the early stages of blooming and numerous patches of muted green found sporadically wherever you looked. 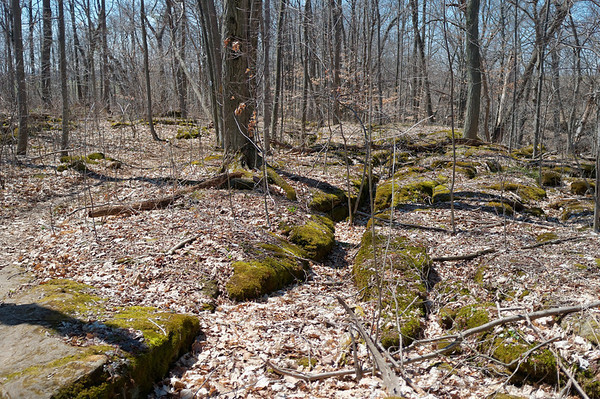 The dry (and dead) leaves with their near-white, light brown, and beige colours blanketed the bare forest with a very nice and tranquil earthy atmosphere. It doesn’t always provide for an interesting view but sometimes you can find an unexpected surprise along the way — like snakes. 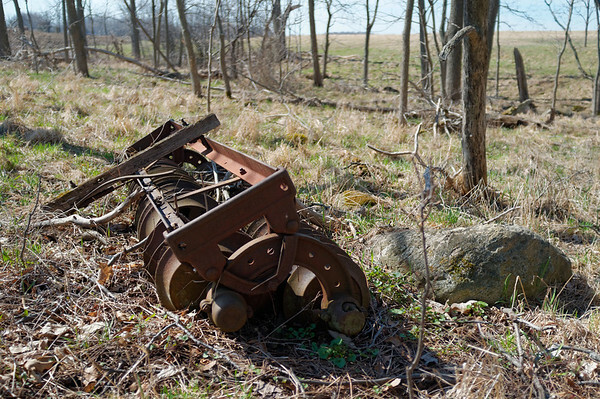 Other times, rusty old machinery or equipment and even the odd concentrated patch of daffodils ready to bloom. My only concern here is that the rust may be toxic to the vegetation. Breaks can often be one of the most peculiar and interesting moments during the trek. People seek out the local “restroom” (i.e. behind the bush, boulder, etc.) while others look over what others are snacking on or have brought along. Usually I’m a little lazy when it comes to snacks so I pack a ton of energy and granola bars. I think I might change that up a little in the future. 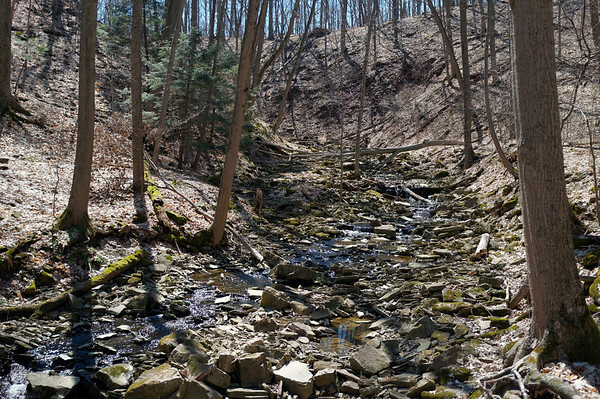 Streams and brooks are ideal for washing off some of the mud accumulated from the hike. The trail passes through (or over) a number of these. We like to observe one another attempt to find a way to get across without getting wet. Me? I just wade right through to wash off the mud on my boots (thank you waterproof boots). This section of the trail was actually very pretty. We saw numerous streams and small waterways with many leading towards some beautiful waterfalls. The geological formation in some areas like the photograph above is simply stunning on its own even without the greenery that we expect from the vegetation surrounding it. 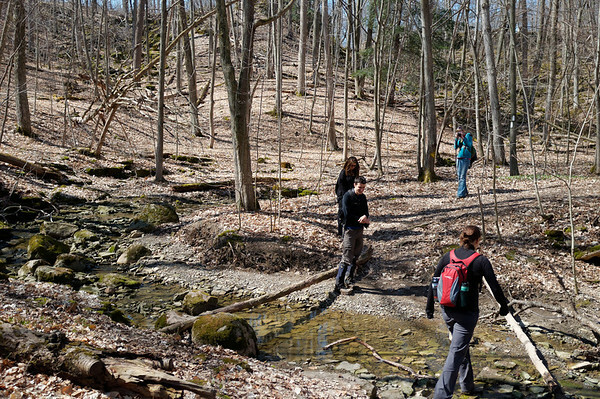 Hiking with a larger group can slow you down but for what it takes away, you get in return lots of laughs and chuckles. The many personalities shine through, and things you never thought of or noticed are brought to light thanks to the folks who join in on the fun. 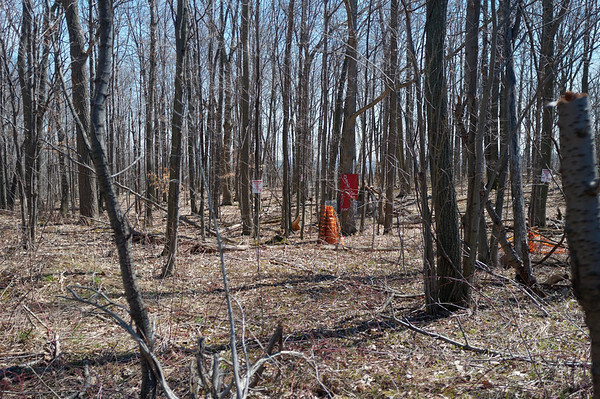 As we progressed through this section of the trail, we came across a rifle firing range. We had initially thought we were hearing fireworks but we came to the realization that it was a firing range when we saw a large set of trucks parked in the distance — not to mention large signs warning us not to trespass. 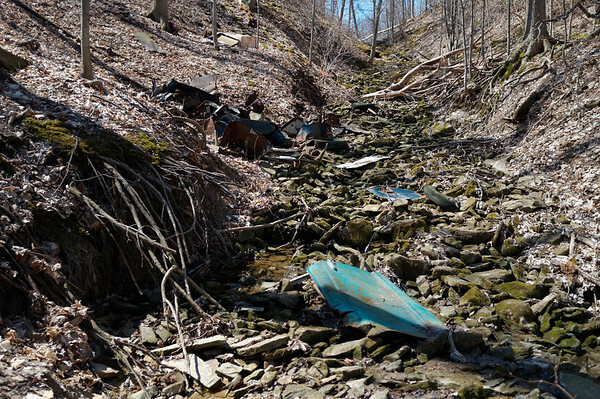 When we arrived at one of the steepest hills that the group had to climb, I noticed a fair amount of “junk” laying around at the base of the valley. I am still puzzled how all these pieces of a vehicle or machine managed to find their way here. 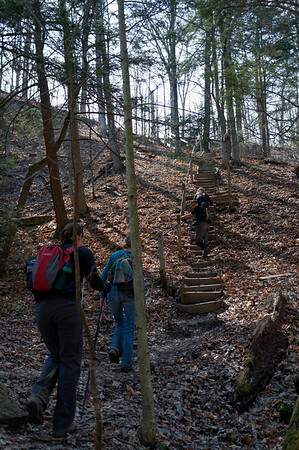 The groups toughest challenge was likely this steep hill and a large staircase later in the section of the trail. 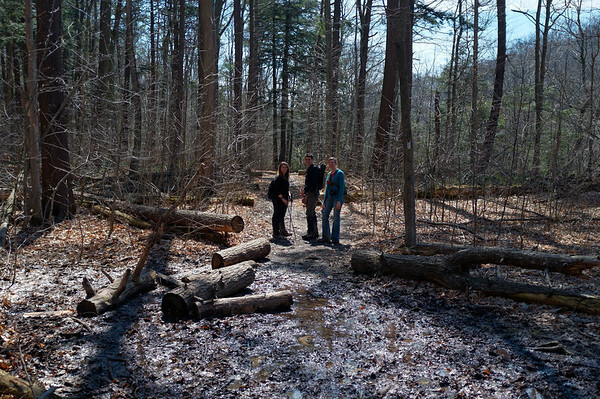 We did however encounter a volunteer who was clearing out some branches and taking care of the trail. I’m thankful for all the people who sacrifice their time to help make this trail accessible to folks like myself. 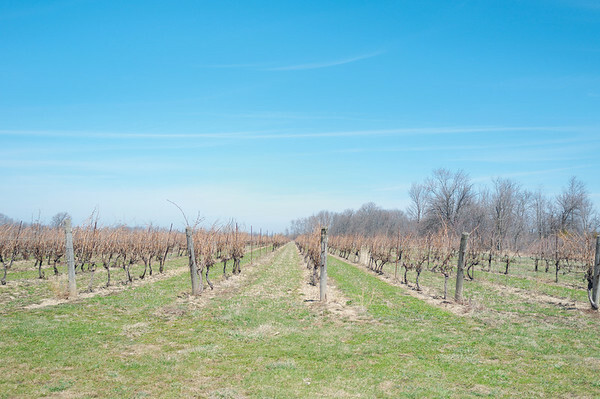 You just can’t continue through the Niagara section of the Bruce Trail without passing by vineyards over and over again. 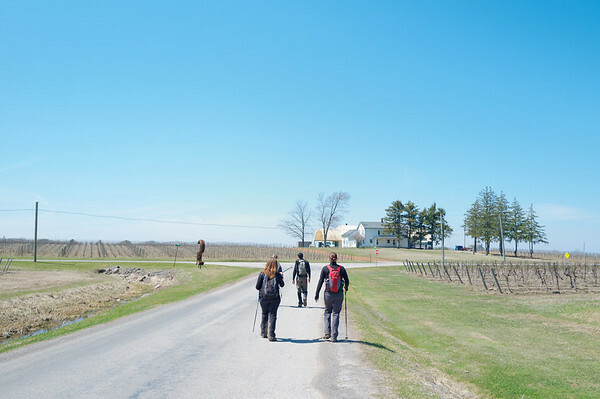 I think at some point some members of the hiking group have begun contemplating acquiring their own vineyard as part of their retirement strategy. As always, lunch on a hike is fantastic. We parked ourselves next to a stream and even had a friendly toad that hung around us until we finished eating. So far my lunch has always been a peanut butter and banana sandwich, and an apple. Suggestions for changing it up are welcome! Briefly hiking further after lunch, we encountered what we should have chosen as our lunch spot. Louth Falls was a beautiful waterfall that we were completely not expecting during our hike. 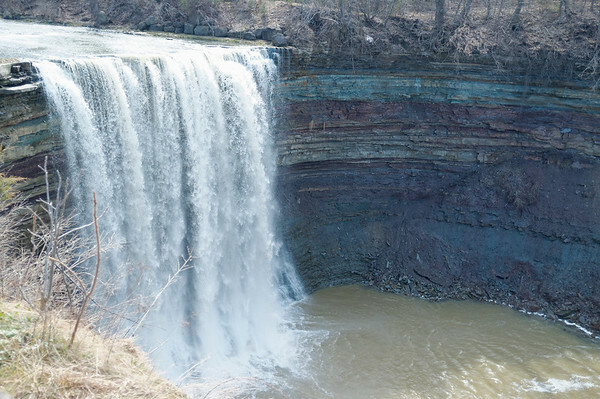 I highly recommending stopping by and taking in the surrounding area around Louth Falls. The terrain that we’ve begun noticing as we are trekking along the escarpment is the rocky formation that you see in the photograph above. 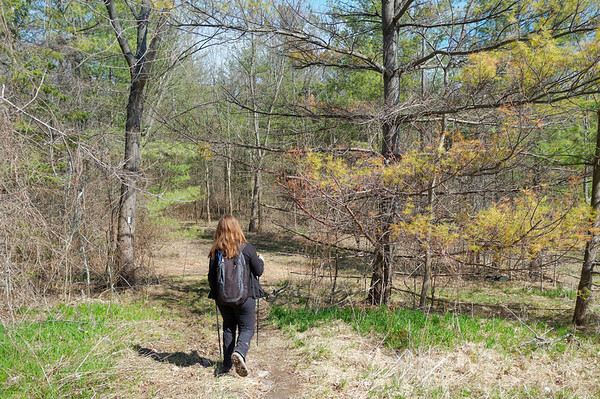 It’s tricky for less experienced hikers to watch over because you can trip easily but as long as one paces themselves and is careful, it shouldn’t be a major issue. It is a very nice change in scenery and footwork. Of course, that was only a short run until we returned to looking at vineyards again. 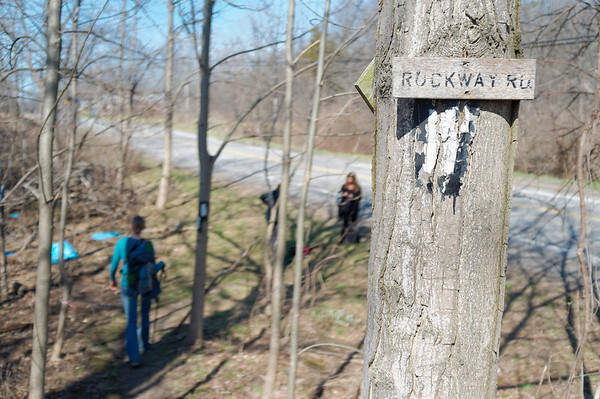 I wonder if the plan is to try and get Bruce Trail hikers to stop for wine tasting. 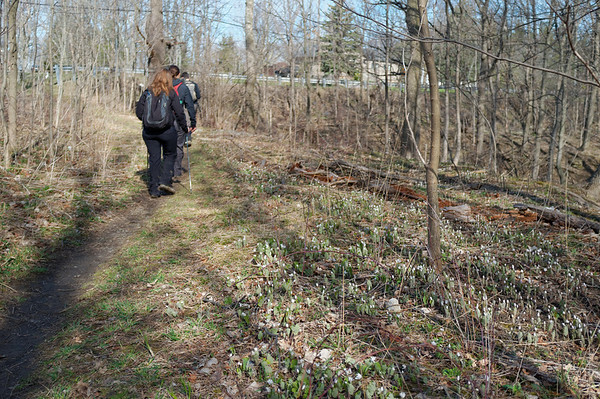 Surprisingly enough we passed by very few residential areas during this section of the trail. From the escarpment we did notice some very nice houses. 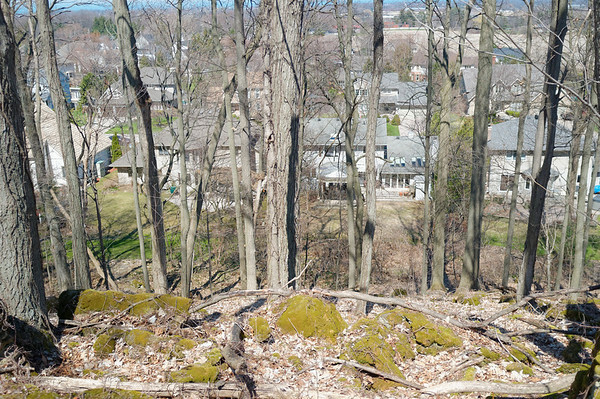 I don’t know if I would want my home at the base of the escarpment though. It never ceases to amuse me how everyone finds amusement in others crossing through mud. I guess it’s the fact that it simply is so messy that most would try to find any way to avoid it. There was a time when I even lost my boot in the mud. Left standing with one foot, I had to call out to my friends to retrieve my boot so that I could that make my way out of the muddy patch. As we progressed through the remaining section of the trail, which might I add is another very pretty section but I have to limit the number of photos somehow — the major challenge left right before the finale is a giant staircase. Unfortunately for those who have weak knees or knee issues, this does pose an issue as it did for a couple of our hiking group members. It simply takes a little more time with a gradual ascent. After climbing that giant set of stairs, we made our way through a historical “pioneer village” of sorts and arrived at the lookout point for Ball’s Falls. Not exactly the nicest looking waterfall but it was a nice way to end the hike. 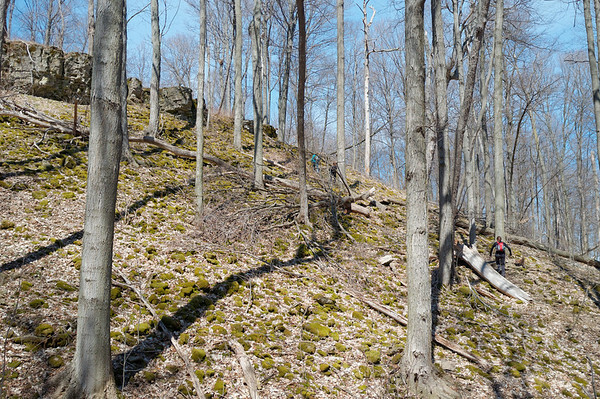 Take a look through the full gallery for part 4 while we set off for part 5 of the Bruce Trail trek!